How to choose an enduro bike: Like trail bikes, enduro (sometimes referred to as “all-mountain”) bikes work well for many different types of applications, but they place more emphasis on downhill performance. They typically feature a single chainring transmission with 11 or 12 gears out back, and will as often as not have a chainguide or bashguard installed by the manufacturer. These single-ring, wide-range drivetrains allow riders to climb to the top of the hill while enjoying better chain retention on the way back down the trail. 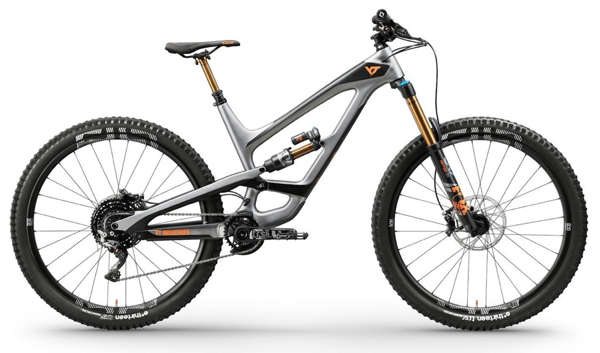 To be classified as an enduro bike, frames and forks typically have anywhere between 6 and 7-inches of suspension travel, which provides performance levels close to those of a downhill bike in rough terrain. 26”, 27.5” and 29” wheel sizes are available, with the latter two dominating the market for the past few years. Depending on the components of a build, most enduro bikes usually weigh around 30-35 pounds and come with ~2.4 to 2.5-inch wide tires. If you're looking for a bike that can "do it all" without giving up much performance when things get rowdy, this is the right type of bike to consider. It won’t be perfect for everything, but there is not much it can’t do either. Suspension: The performance of forks and rear shocks play a major role in how a bike rides. The best suspension will feature adjustable rebound, compression, air pressure and/or preload settings. Brakes: To go faster you need to be able to stop, and this is especially true of a bike designed to take on steep and rough terrain. Look for hydraulic disc brakes from a reputable brand (SRAM, Shimano, Hayes, Magura, Formula, and Hope are all good brands). Saddle: Since you are likely to be seated a lot on an enduro bike, it’s important that your bike has a comfortable saddle. If you can, test a few options before you buy. Many shops will work with you to swap saddles when you purchase a complete bike. Seatpost: Height-adjustable (also known as “dropper”) seatposts are pretty much an indispensable feature of any modern enduro bike. A dropper post lets you change your saddle height on the fly to match the terrain you’re about to drop into. We don’t recommend buying an enduro bike without this option today. Stem Length: On an enduro bike, look for a stem in the 40-50mm range. This keeps your weight in the right position and provides balanced handling in high speed or technical riding situations. We always recommend going with a shorter stem and wider bars whenever possible. Chain Retention: If you don’t like having your chain come off in rough terrain, look for bikes that have a chainguide on the front chainring. Today’s “narrow-wide” chainrings and “clutched” derailleurs do a good enough job of keeping your chain on in most situations, but a chainguide will make sure. Tires: Wider, heavier-duty tires are preferred for enduro bikes because they offer high levels of traction and flat protection. Most enduro bikes come fitted with tires ranging from 2.3 to 2.5-inches wide from the factory. The recent “Plus” tire trend has seen the emergence of enduro tires up to 2.8” wide, but the current consensus holds that anything above 2.6” is more of a specialty item only to be considered in certain types of terrain. The most important number when it comes to sizing a modern enduro bike is reach. Bikes have steadily grown in reach as bike geometry has evolved to cater to today’s riding styles, but not all brands view this aspect of sizing in the same way, to the point where there can be large discrepancies between the reach numbers of bikes with the same nominative size from different manufacturers. Your choice of reach/size also depends on personal preference as well as the type of terrain you ride. One other important part of sizing a bike is making sure you have enough standover clearance and a seat tube that is low enough to let you run a long dropper post. As a rule of thumb, there should be at least four inches of clearance from the top of your inseam to the top of the top tube. Note that for some frame models the distance will be much larger than four inches due to a sloping top-tube. This is normal, provided the length and cockpit area of the bike fit you well. Most manufacturers provide suggested sizing charts, and because models vary so much between categories, we recommend searching for the chart specific to the bike you’re interested in. As previously mentioned, your personal preferences play an important role here, so it’s best to test out a variety of sizes before making a final decision. The overall feel of a bike is largely dependent on what material(s) the frame is made of, so this is an important consideration. Aluminum - Aluminum is light, stiff, and quite affordable, which has made it the most commonly used frame material. Because the material is so stiff, aluminum bikes are characterized by a slightly rougher ride than those made from chromoly or titanium. Carbon Fiber - To make carbon frames or parts, thin strands of carbon fiber are twisted and/or woven together and then layered in a mold and coated with a stiff resin or plastic. Carbon is among the lightest materials and is commonly used for high-end cross-country and trail bikes, but it has found its way into enduro, freeride, and downhill bikes as carbon construction techniques have improved. Today, carbon enduro bikes can be made stronger and lighter than their alloy counterparts, although the material may sometimes be more sensitive to impact damage than a frame made from aluminum. Chromoly Steel - Chromoly (a steel alloy) is generally lighter than high-tensile steel. It is also strong, responsive, and offers a relatively supple ride. However, it is heavier than aluminum, carbon, and titanium. Titanium - Titanium (commonly referred to as “ti”) is very light and stronger than steel. It is also very expensive, and for this reason it is usually only seen in very high-end or custom frames. Like chromoly, titanium also offers a smooth ride because it flexes well. Material Combinations - If a frame is made of more than one material, it is usually carbon fiber and a metal - either steel, aluminum, or titanium. Actually blending materials is not common, but making different parts of a frame from different materials is (e.g. – a carbon fiber front triangle with an aluminum swingarm). A frame made out of more than one material can help provide better stiffness, compliance, or damping in specific areas, and can also be made more resilient in certain zones as appropriate (e.g. aluminum chainstays on a carbon frame). If you’re considering an enduro bike, you’ll need to decide between 27.5-inch and 29-inch wheels, as these have all but replaced the previously most common 26-inch wheel size. So-called “Plus” tires have also become available over the last few years, mainly in the 27.5-inch category, where the bigger volume tire provides a slightly larger rolling diameter and allows for significantly lower tire pressures. Plus tires generally require a frame that can handle the extra width as well as offer the necessary geometry tweaks to maintain the bike’s handling (some manufacturers offer bikes that can work with either 29-inch or 27.5+ tires). In general, a larger diameter wheel rolls over obstacles more easily and can provide better traction due to a larger contact patch. On the other hand, larger wheels are inherently heavier, more flexible, and may become cumbersome to move around for smaller riders. If you’re on the fence about wheel size, we highly suggest testing all available sizes and options before making a purchase. Deciding how much to spend is always a difficult decision. As a general rule, the more you spend the better bike you get, and there will significant differences between a $900 bike and a $3500 bike. Most of the time, the more expensive a bike is, the more durable it will also be (except on certain high-end bikes where extremely lightweight construction may have been favored over durability). Similarly, more expensive bikes feature components that perform better. If you’ll be riding regularly, we recommend spending at least $2500 on a full-suspension enduro bike. Anything less and your bike is unlikely to hold up to the demands of enduro riding for long. If you’re a first-time buyer, you may feel like you should buy a low-end bike and later upgrade the components as you go along. Know that components sold as part of a complete bike are much cheaper than the same components purchased off the shelf as after-market items. For comparison, here are three enduro bikes priced at $3200, $5000, and $8399, respectively. Be sure to do your research and read as many product reviews as you can. Reviews are the best way to find out more about the model of mountain bike you are interested in, user impressions, and things to watch out for or that need upgrading early on. After you’ve purchased a bike and had enough time to put it through its paces, why not leave a review for other people to see when they are researching bikes as well? We hope you found this information useful. If you still have unanswered questions, our mountain bike forums are a great place to get advice from fellow riders. Your local bike shop is also an awesome resource and the best place to test ride bikes before making up your mind. Still need help picking the right type of bike? Check out our general Mountain Bike Buyer’s Guide.